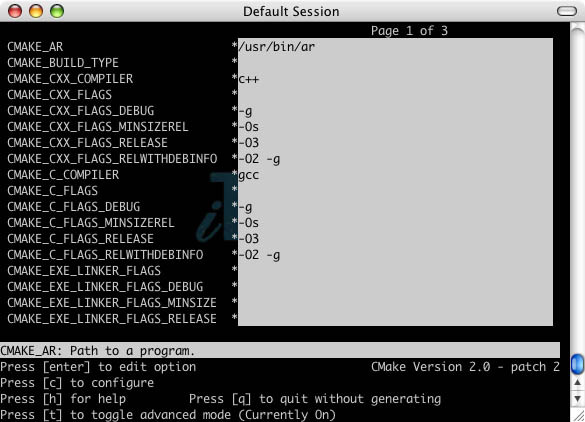 Mac OS has a GUI for CMake; however, because there are files that will need to be selected that reside in directories that are typically hidden, it is better to run the Curses version of CMake from the command line. Before beginning using CMake, make sure that Coin3D is installed and that the QUANTA library named libquanta_32.a is available. CMake is a program that creates make files, or instructions to your compiler, about where to find files when taking the source code of Immersaview and turning it into a usable executable. There are two parts to compiling Immersaview. The first part involves creating a file named libQAvatar.a which is used to manage remote mouse pointers during a collaborative session. The second part involves creating the immersaview and immersaviewserver executables. This example is going to assume that the immersaview ZIP file was uncompressed in /immersaview. As a result, the "base" immersaview directory is /immersaview/immersaview0.40. Additionally, for this example, all supporting software like QUANTA are assumed to be located in /immersaview/QUANTA-0.4. Finally, it is assumed that CMake was installed in /immersaview/cmake and to run ccmake (the Curses CMake), it will be necessary to type the following at the command line: /immersaview/cmake/bin/ccmake. The paths given here and throughout this document should change based on the locations where these and other appropriate files reside. However, to give some frame of reference, the paths already described will serve as the example throughout this document. Each field listed here represents a directory or a filename that should be specified in order to have CMake create the proper makefile to generate libQAvatar.a. There are CMake scripts that attempt to search and find these files and directories. If they are successful, then everything will appear as you see above (but that does not mean that the scripts chose the correct locations). Usually the first time that configuration occurs, all of the fields become marked with an asterisk '*' regardless of whether or not they are correct. Typically, whenever there is incomplete, uncertain, or erroneous information for one of these fields, CMake marks the field with an asterisk. If the information is correct, CMake will remove the asterisk. Typically after configuring CMake for the first time, just about every field is marked with an asterisk unless CMake seemed to have found the appropriate file or directory. Even though the asterisk would imply that the field must have some new information specified, it may not be necessary since not every field needs to be updated in order to be correct with reference to CMake. As a result, the fields that must be changed will be directly specified in this document; otherwise, it would probably be best to leave the field as it is. It is possible that additional fields may cause errors that may be related to one's local configuration. For this reason, it is up to the user to determine and correct the source of these errors. To change the information of a particular field, one needs to move the cursor to the field and press the Enter or Return key. To delete the field completely, one can press the key combination Control-K. Afterwards, one can type the information into the field or copy it into that location from another source. When one is done entering this infomation, press the Enter or Return key. QUANTA_INCLUDE_DIR: There is a directory named include that should reside inside the directory where QUANTA was downloaded. For this example, this directory can be found in the following location: /immersaview/QUANTA-0.4/include. QUANTA_quanta_LIBRARY: The QUANTA library that must be found is named libquanta_32.a. To help keep things organized, when the author compiled QUANTA from source, an install directory was made from the base QUANTA directory. It is in the install directory that libquanta_32.a should exist. If someone installed QUANTA to a different location, then this path would probably differ. So, for this example, the absolute path to the library is: /immersaview/QUANTA-0.4/install/lib/libquanta_32.a. Once the information has been entered, it will be necessary to configure CMake again with this new information by pressing the 'C' key. As long as the information in the specified fields is acceptable to CMake, any asterisks that may have appeared should now have gone away. If an error does occur, CMake will place an asterisk to the left of the field's information. In this case, one can either make the change to the erroneous field(s) or ignore the error(s). If one desires to fix these problems, simply make the appropriate changes to the erroneous fields and configure CMake again by pressing the 'C' key again. Repeat this process until the error stops occurring. Once things are configured as one would like, press the 'G' key to generate the makefile. This should make the CMake end and return the window to the command line. 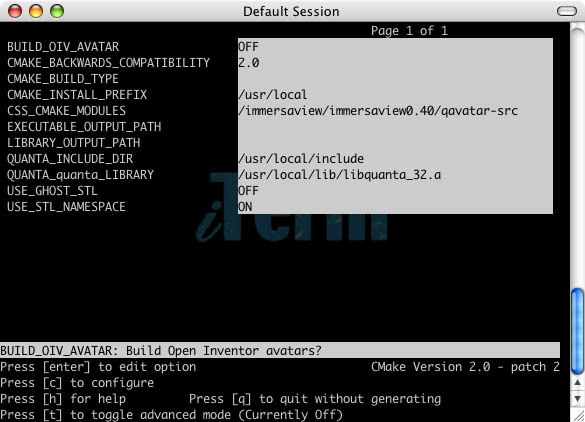 If all of the files and directories were specified correctly, the end result should involve libQAvatar.a being present in the directory named build-qavatar. For this particular example, the location to this file is /immersaview/immersaview0.40/build-qavatar/libQAvatar.a. Remember the location of this file since it will be used in the next section. GLUT_INCLUDE_DIR: According to CMake, it is necessary to find the directory that contains glut.h. Since this is something that may not be well known, it may be best to search for glut.h. However, sometimes it is just better to ask someone who knows...and the person who saw what I originally wrote recommended using /System/Library/Frameworks/GLUT.framework/Headers. INVENTOR_INCLUDE_DIR: It is probably easiest to use whatever CMake returns as the location for the Coin3D/Open Inventor include directory. It would also be recommended to install the precompiled binaries from the Coin3D website for your particular version of OS X. For this example, simply make sure that the following is specified: /Library/Frameworks. INVENTOR_oiv_LIBRARY: Again, whatever CMake returns is probably just fine if Coin3D was formally installed on your system. For this example, make sure that -framework Inventor is given. QAvatar_INCLUDE_DIR: Just reuse the source directory that was used to specify the location of qavatar-src. For this example, this directory can be found in the following location: /immersaview/immersaview0.40/qavatar-src. QAvatar_LIBRARY: This is where that request to remember where libQAvatar.a comes in. This library is going to be located in build-qavatar. For this example, this library can be found in the following location: /immersaview/immersaview0.40/build-qavatar/libQAvatar.a. QUANTA_INCLUDE_DIR: Use the same directory that was used when building libquanta_32.a. For this example, this directory can be found in the following location: /immersaview/QUANTA-0.4/include. QUANTA_quanta_LIBRARY: Use the same directory that was used when building libquanta_32.a. For this example, the absolute path to the library is: /immersaview/QUANTA-0.4/install/lib/libquanta_32.a. 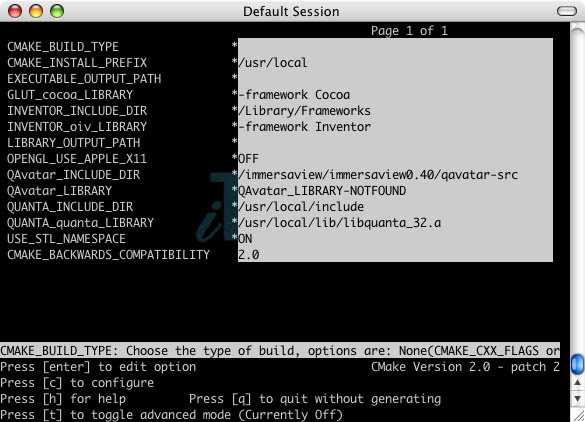 Once the information has been entered, configure CMake by pressing the 'C' key again. As long as the information in the specified fields is acceptable to CMake, all of the fields should not have any asterisks near them. If an error does occur, CMake will put an asterisk by the problematic field. In this case, one can either make the change to the erroneous field(s) or ignore the error(s). If one desires to fix these problems, simply make the appropriate changes to the erroneous fields and configure CMake again by pressing the 'C' key. Repeat this process until the error stops occurring. Once things are configured as one would like, have CMake generate the appropriate makefiles by pressing the 'G' key. This should make the CMake disappear and allow the command line to return to the window. Both of these executables should now reside in build-immersaview. Now, things should be ready to go. If there are any questions or feedback on this document, please send mail to cavern@evl.uic.edu. This document was last revised in August 2004.